At Schackelford Heating & Cooling, we offer many different kinds of heat pump configurations. The most common is what’s called a split system. This simply means that your solution will have components that reside both inside and outside your home. 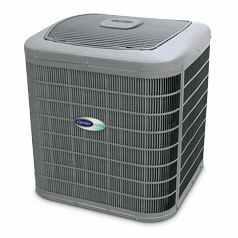 The heat pump itself sits in your yard like a central air conditioner unit. Inside your home an evaporator coil to convert refrigerant and a blower motor to move the treated air is needed. Often this is a combination of your furnace attached to an evaporator coil, but sometimes, only a fan coil is used for both functions.